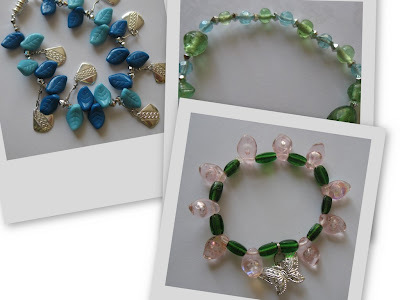 Here are some last minute gifts I whipped up with my girls – some bracelets we put together with an awesome bag of beads from my cousin - I wanted to make some more this evening but can't find our crimp beads anywhere! I am so frustrated - now I really have to clean up. And if I don't find them then I'll have to drive out tomorrow and get some more... it's like the book If You Give a Mouse a Cookie... then I'll have to get dressed (vs. staying in pj's all day) and while I'm out, I'll have to stop at the grocery store, then I'll get hungry and have to stop somewhere to pick up lunch, and then I'll see a friend and make a date for tomorrow night, and then I won't be beading until Sunday! I bought the most fantastic book today & I don't care how difficult the projects look, I have to make these rings, bracelets and necklaces. The book is Bead Fantasies IV (affiliate link) and it is fabulous. 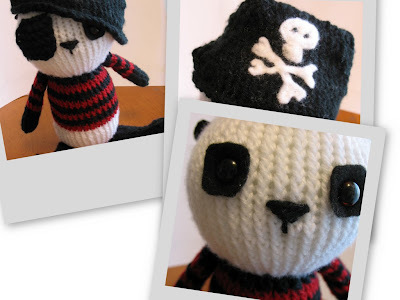 Next, well -this wasn't really whipped up at the last minute - Pirate Panda - the pattern was from purl.etsy.com and it is so cute! Last, but not least, this wonky looking bird. I love the way needle punch looks like miniature hooked rug - but it was a lot harder than I thought it would be to do! Well, my sewing machine is in the shop for a week or so for a 'check-up'. Now I need to keep myself busy. Of course, I'll think of 100 things to do that require machine sewing - I can always take out my old one if necessary. But I will try to resist, do some knitting, beading and cleaning up around here. I really need to get the ball rolling on the valentine projects I have brewing in my head - I have to focus this weekend.